Homeopathy is a system of medicine which is based on treating the individual with highly diluted substances given in mainly tablet form, which triggers the body’s natural system of healing. 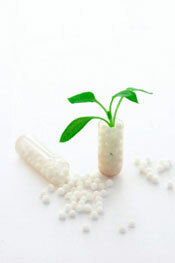 Based on their experience of their symptoms, a homeopath will match the most appropriate medicine to the patient. It works on the principle of like cures like – that is, a substance that would cause symptoms in a healthy person is used to cure those same symptoms in illness. For example, one remedy which might be used in a person suffering from insomnia is coffea, a remedy made from coffee.